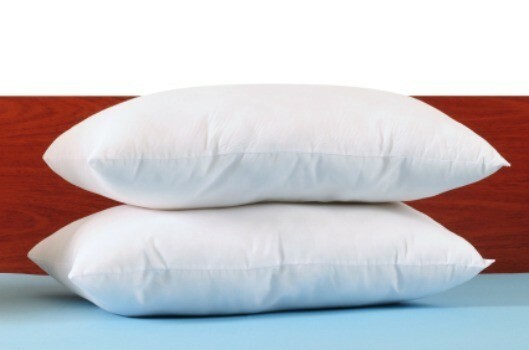 Just like your bed linens, the pillows need cleaning too. This is a guide about washing bed pillows. Ever washed your polyester filled pillows and get them out of the washer all mushed up in an odd shape? Well, do a little pre-wash work. Take a darning needle and thread it with heavy yarn. Then run the yarn through both the cover and the filling and tie the same way you would tie a quilt. Do this in different areas of your pillow and then toss in the wash. When it is done it should be in the same shape as when you threw it in. I never dry my pillows in the dryer but do hang them to dry on the clothesline. Tips for washing bed pillows. Post your ideas below. Wash bed pillows in a laundromat front loader washer. Because of their size, they need a lot of room to tumble. When you put them in the dryer, toss in a couple of tennis balls. It is noisy and annoying, but it fluffs up the pillows a mile high. Also works with comforters and parkas. Another thing you may want to do is to run long stitches from 1 side to the other to make sure that the filling doesn't shift or bunch, the stitches should be about 4 in. apart in a grid pattern and pull them fairly tight. Add one cup of white vinegar and 1/2 cup baking soda for extra deep cleaning. Ah, yes, be sure to check for sturdy seams....it is a lot of fun picking that batting out of the washer if they come loose! I just put two pillows in a load and do a normal wash. They come out very nice. I read that you should not add baking soda and vinegar together in the wash. They somehow cancel each other out, making them useless for getting anything clean. It was suggested that you add baking soda to the wash and then add vinegar to the rinse for more efficient cleaning. I usually use rubber bands to hold the corners of pillows and comforters instead of sewing. I have thrown in brand new flipflops when I couldn't find new tennis balls. They work fine.